For a change of pace, prepare these delicious brochettes using your favourite firm fish, such as salmon, or tofu. Thread fish and vegetables onto 4 skewers; place in shallow dish. Reserve 1/4 cup vinaigrette; brush remaining vinaigrette onto fish and vegetables. Refrigerate 30 min. Heat greased barbecue to medium-high heat. 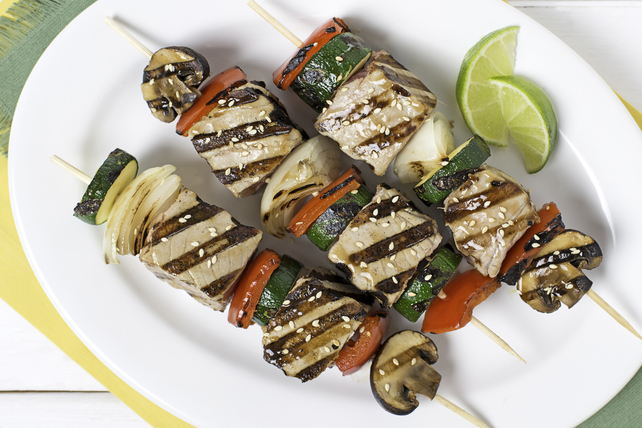 Grill skewers 15 min. or until fish flakes easily with fork and peppers and onions are crisp-tender, turning occasionally and brushing with reserved vinaigrette. To prevent the tuna from becoming dry, watch it carefully to prevent it from overcooking on the barbecue. Serve with lime wedges for squeezing over the cooked tuna before serving. If using wooden skewers, soak them in water for 30 min. before using to prevent them from burning on the barbecue.